Porch lights are great, especially during Halloween. Ever wondered how much it costs you to leave your computer or porch light on all night? Here's your answer. Cliff Notes: Turn computer off when not in use, you're bleeding money even if it's in sleep mode. Leave porch light on (it does wonders for neighborhood safety) but use a compact fluorescent (and a timer, too - then it turn off in the morning and you don't even have to think about it). We are very happy with the photos Joe Fletcher took of our recent project in Albany, California. He really captures the concepts that we considered during the design process: colors, textures, and light. The stair well to the new second floor features a tall window, almost floor to ceiling, with operable awning windows for natural ventilation. You can see the sun beaming through and illuminating the first floor. Clean edges and asymmetry give a modern look, while wood keeps it feeling grounded and timeless. We made sure that the differing wood species on the custom kitchen cabinets didn't clash with the details of the open dining room. Black and red were used to articulate the kitchen. The black toekick, a pretty standard detail in our projects, is effective in making the cabinets look less heavy, particularly when the cabinet and the floor are similar finishes. Windows between the counter and upper cabinets provide a sliced and framed view of the yard. A floor-to-ceiling window in the kitchen lets in a lot of light and separates the full height pantry wall from the counter space. A lowered marble top is used for baking. The upstairs bathroom has two high awnings and a skylight, all providing lots of natural light while maintaining privacy. White cabinets and walls keep the room bright, and allows room for bold and darker colors to be used playfully in an otherwise compact room. You can also view these photos and other projects on our Facebook page. I've been thinking a lot about Coco Chanel lately. Not just her mark on fashion history, but also her profound and timeless quotes. I enjoy how so many of them can transcend the fashion context and be applied to design in general. Here is one I especially like: Fashion is not something that exists in dresses only. Fashion is in the sky, in the street, fashion has to do with ideas, the way we live, what is happening. Replace "fashion" with "architecture", and "dresses" with "buildings". I couldn't have said it better. The best designs are a balanced commentary on its surroundings. I find the best inspiration in the mundane and everyday, like wet footprints, a warm towel right out of the dryer, and the quiet of early morning hours. or dry footprints... although I don't know how this is possible. What inspires you to create? What do you think is beautiful? Welcome to Ogawa Fisher Architects! Our latest news: Hiromi Ogawa Architects will now be Ogawa Fisher Architects. The change reflects the commitment of our two equal partners, Hiromi Ogawa and Lynn Fisher. We will still bring you the same, high level of client services and customized design to every project. Lynn Fisher started working at Hiromi Ogawa Architects in 2006. She became a partner in 2008. Her dedication to each project and wide range of design expertise has steadily gained a loyal following of clients. We are very excited to have our new name represent her tremendous contribution to the company. Our website will now be under www.ogawafisher.com. Please reset your bookmarks. Our blog site will now be under http://ogawafisher.wordpress.com. Please reset your bookmarks and/or blog subscriptions. Our email addresses will change to @ogawafisher.com, with the first part of our address remaining the same. Please make this change in your address books. Our Facebook page will now change to ogawa fisher architects. Please "like" us at our new page so we can keep you up to date. Check out photos of a Berkeley Remodel and Addition we designed back in 2006. Photos by Joe Fletcher Photography. And this is just a partial list. We take care of each project as if it were our babies. We love every home as if it were our own. We treasure our projects and our clients. And we are proud of that. Our local Multnomah Public Library lets patrons borrow a Kill A Watt device to use in their home. This device measures how many watts your fixture or appliance uses. You just plug the appliance into the device, and the device into an outlet. You can also measure phantom energy loads, which is the amount of energy an appliance uses even when it's technically turned off. You know that little red light that says your TV is off? Or the digital clock on your trusty microwave? The Kill A Watt can tell you how much energy those little things are using, too. The best solution for saving phantom energy is to plug a cluster of appliances into a power strip, then switch off the power strip when those appliances are not in use. This is especially helpful around the media console - TV, stereo, DVD player, etc. - where it's a pain to turn everything off one at a time. I know those digital clocks are reset every time they are unplugged, but do you really need 13 synchronized digital clocks in your kitchen? I didn't think so. The device has been around for a while, but what got me excited is the fact that my library lets me and everyone else check it out and use it. Not everyone needs to own a Kill A Watt, but I bet many people want to try it out for a few weeks around their home. Find out if your local library has this device or something similar available, and if not, it would be worth requesting it. Brian Libby at Portland Architecture interviewed Hiromi about our recently completed project in North Portland, as well as our company's general approach to projects. You can read more about it here. I just returned from Japan, where it has been unusually hot this summer. To escape the heat, my family and I stayed in Hakone for a few days. (It is higher in altitude than Tokyo but we found that it was equally hot in Hakone, too.) The area is known for its beautiful countryside and historic hot spring, but during this visit we also fell in love with the Hakone Open-Air Museum. Most of the work is installed outdoors, where the sun and foliage play against the art. Many of the pieces were interactive, like the garden maze above. Even though the art never seemed overcrowded, there were things to see at every turn. 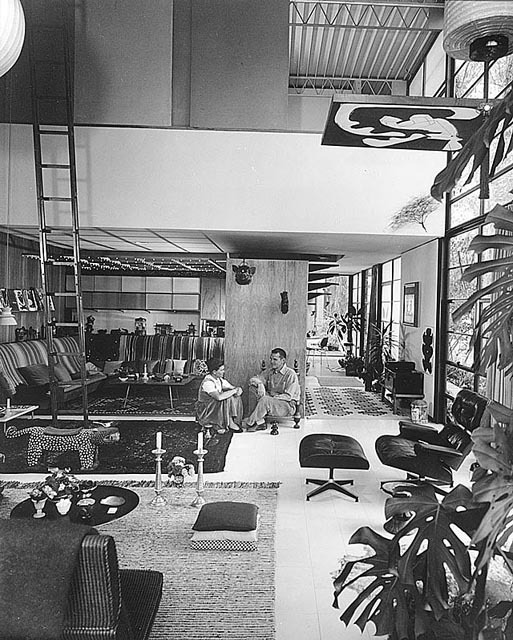 It felt like an outdoor version of Charles and Ray Eames' living room: things weren't on display, they were placed as a backdrop for living. Almost everything in the museum was enjoyable for children. They seemed to understand what the art wanted them to do - to touch, to inquire, and to enjoy. The child in me really liked the woven sculpture by Toshiko Horiuchi, housed in a heavy timber pavilion by Tezuka Architects. I feel refreshed and inspired after seeing art and architecture working together to create an environment that everyone can enjoy. I recommend you visit the museum next time you're in Japan. Opening reception for our Portrait show was a great success. Artist signed and numbered notepads are still available but are limited in supply. $10 for 1 or $27 for a pack of 3. Comment on this post or send me an email with your order. No. 2 is an orange portrait, with blank paper. No. 3 is a pink portrait, with lined paper. No. 5 is a blue portrait, with gridded paper. No obligation to buy the notepad with my face on it, although it gives you an excuse to draw a huge mustache on me. Buy all three and you can explore all kinds of facial hair.